Our newsroom offers information and resources for journalists. Get the latest news about engine orders, program and product milestones, and stories illustrating how Pratt & Whitney employees go beyond for our customers. 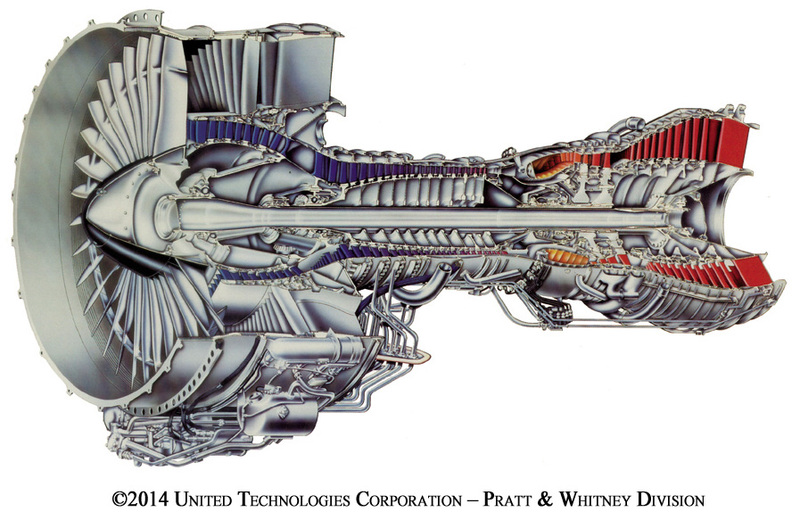 Pratt & Whitney's PW2000 engine covers the mid-thrust range from 37,000 pounds to 43,000 pounds. The PW2000 powers all models of the twin-engine Boeing 757, and is the exclusive power as the F117 for the four-engine C-17 Globemaster III military transport. The PW2040 model also power’s the U.S. Air Force’s C-32A, the military version of the 757. The PW2000 engine entered revenue service in 1984 as the first commercial engine with FADEC (Full-Authority Digital Electronic Control) technology. Pratt & Whitney introduced an improved version of the PW2000, the Reduced Temperature Configuration (RTC) in 1994. This enhanced model offers improved reliability and durability for long on-wing times and reduced total maintenance cost, along with excellent environmental performance. The PW2000 is approved for 180-minute Extended-range Twin-engine Operations (ETOPS) and meets all current and proposed noise and missions regulations worldwide. Experts at our state-of-the-art Global Operations Center are available 24/7/365 to answer your call.